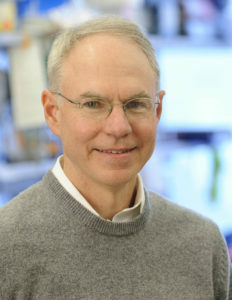 Charles L. Sawyers, MD, chair of the Human Oncology and Pathogenesis Program at Memorial Sloan Kettering Cancer Center, will keynote the 13th Annual Lewis Landsberg Research Day on April 6. The 13th Annual Lewis Landsberg Research Day will be held Thursday, April 6, at 1 p.m., kicking off with a keynote presentation from Charles L. Sawyers, MD, chair of the Human Oncology and Pathogenesis Program at Memorial Sloan Kettering Cancer Center. The keynote, entitled “The Changing Landscape of Cancer Drug Resistance,” will be held in the Robert H. Lurie Medical Research Building, John Hughes Auditorium. Sawyers studies mechanisms of cancer drug resistance with an eye toward developing novel therapies. He co-discovered the antiandrogen drug enzalutamide, which was approved by the FDA in 2012 for treatment of advanced prostate cancer. Sawyers received a bachelor’s degree from Princeton University in 1981 and a medical degree from Johns Hopkins University School of Medicine in 1985, followed by an internal medicine residency at the University of California, San Francisco. He became a Howard Hughes Medical Institute Investigator in 2002 while at the University of California, Los Angeles, then moved to Memorial Sloan Kettering Cancer Center in 2006, where he currently serves as chair of the Human Oncology and Pathogenesis Program. Sawyers is a member of the National Academy of Sciences, the Institute of Medicine and the American Academy of Arts and Sciences. Read more about Sawyers’ career and research. Feinberg’s annual Lewis Landsberg Research Day is a campus-wide event to promote faculty and trainee development through the sharing of exciting research and conversation with colleagues. Junior faculty are especially encouraged to submit abstracts and to network and exchange ideas with Feinberg faculty. Research Day also provides an opportunity to learn about the Research Cores and the full spectrum of support they provide for clinical and basic science research. Check out the entire Research Day schedule of events, which includes a poster session and awards ceremony.